I haven't. And I don't think I've played the Greek bishop sacrifice either... I wonder if it's because I haven't had the opportunity or have missed the opportunity? I've delivered the Greek gift many times in blitz and so forth. I don't recall if I've ever done it in a serious game: I have a strong hunch I did as a junior, but my memory is far from reliable. The only 'textbook' sacrifice I've done in the last two years, ie since I've been playing for S&BCC, was a Bxb5+ versus the Sicilian. I've got a feeling I did it against Andy Thake once - although perhaps it was one of those when he had a Bishop on g4 and after Kxh7 you play Ng5 + then Qxg4. In any event he played ... Kh8 instead of taking the bishop. If I recall correctly I was just a pawn up for nothing (and he had an open king) but I messed up and he won in the end. Talking of AT, as anybody heard from him recently. Is he still hanging out with the ladyboys? Forgot to say I've definitely played a greek gift once or twice in blitz chess on line. Haven't done it in a real game though. WHEN WAS THE CLUB AGM ? As far as I know, this double bishop sacrifice was first played in a game Lasker-Bauer (Amsterdam 1889) and has since been known as the Lasker Combination. Unfortunately in that game there wasn't such a neat finish as Black was able to give up his queen to avoid the immediate mate. p.s. I once played the Greek gift sacrifice in a Surrey League match against Crystal Palace about 20 years. I'll be coming back to the Lasker-Bauer game in the next couple of weeks as it happens. You're quite right though, there are a few examples of the sacrifice that end up in material gain rather than a mate - which certainly sees a shame to me. BTW: I've never heard of the comibation being named after Lasker before. Do you have a source? I'm planning a series of articles on the theme and any information you have will be useful. I remember seeing a whole book on this combination in the BCM shop titled 'Lasker's Combination' and published by Pickard. Not sure if we've still got it in stock; I'll have a look tomorrow. 1. b3 Nf6 2. e3 e6 3. Bb2 Be7 4. g4?! O-O? 5. g5 Ne4 6. h4 Nd6 7. Bd3 b7? 8. Bxh7+! Kxh7 9. Qh5+ Kg8 10. Bxg7! Kxg7 11. Qh6+ Kg8 12. g6 fxg6 13. Qxg6+ Kh8 14. Qh6+ Kg8 15. Nf3... And now there is no salvation from Rg1. 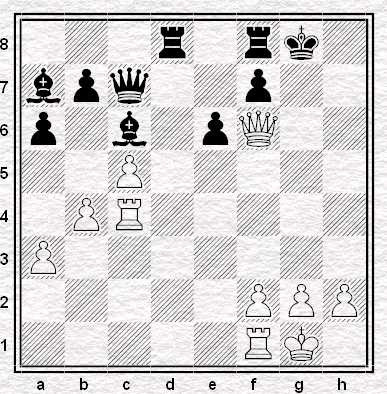 Game continued: 15...Rf6 16. Rg1+ Kf7 17. Qh5+ Kf8 18. Qh8+ Kf7 19. 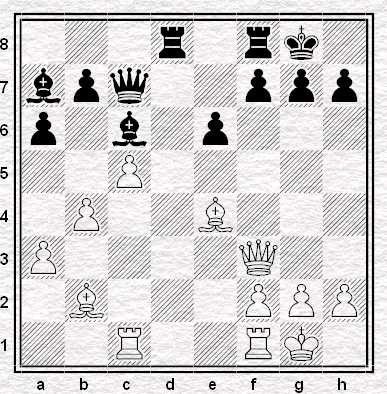 Ne5# Neat mate with knight. The salvation comes in the form of 15..Bf6!